Second Empire houses get their name from the Second Empire period in France (1852-1870) during the reign of Napolean III. The most easily identifiable feature was the use of mansard roofs to envelope the top floors in the roof line. 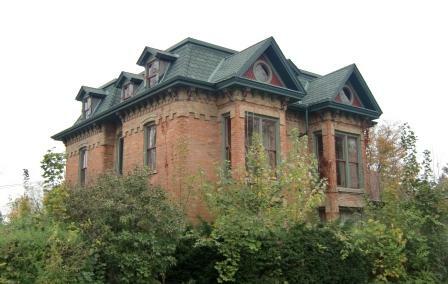 It is a Victorian era style, and Second Empire features were applied to plans that might otherwise be described as Italianate or Stick or even Queen Anne. Second Empire architecture was popular in the United States for government buildings to the point where it was often referred to as the “General Grant” style. 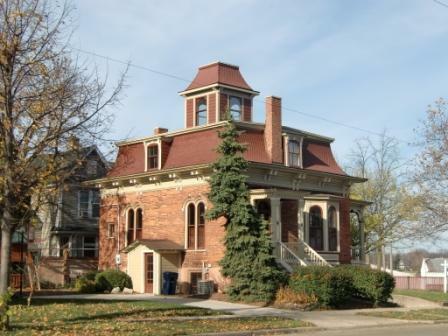 In the Midwest it was the favored style for county court houses. When used on public building it was heavily ornamented with classical details. An abundance of columns and pediments gave the buildings a busy feeling. The French used the term “horror vacui” or a “fear of open spaces” to describe this lack of plain surfaces. Columns often came two at a time. The pediments and columns did not stick out from the building very far. There were no projecting temple porches. As a result the buildings look like a solid mass with lot of detail cut in relief. Columns were rarely more than one floor high, but often stood stacked, one on top of another, like layers of a wedding cake. 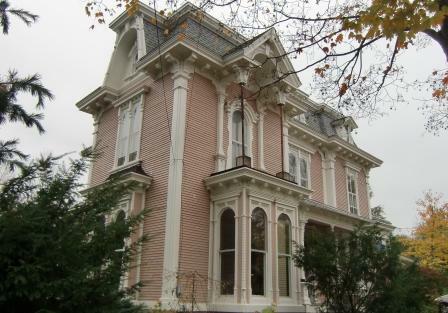 In America the Second Empire house often simplified down to a mansard roof on an Italianate frame. The eaves weren’t quite as large, and the cornice might be rounded, but otherwise it had little to distinguish it from its neighbors. The mansard roof had a revival after World War II, but the houses underneath were more Norman or Provencal. GI’s returning from Europe brought a taste for it with them, but the inspiration was from the countryside and the houses there were simpler, and the houses back home had moved away from the Victorian embodiment of the clapboard house, so the result was something distinctly different than the Second Empire look of the Victorian era. 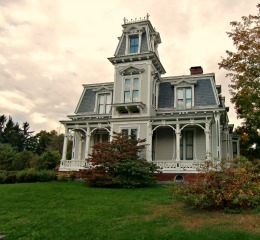 If you enjoyed this article, you may also be interested in my other articles on house styles, where I talk about Georgian, Federalist, Greek Revival,Carpenter Gothic, Italianate, Stick, Queen Anne, Cape Cod, Tudor and Craftsman style homes.